Happy days are here again for the stock market. The Dow and S&P 500 both closed at record highs and the tech-heavy Nasdaq hit its highest level since the peak of the dot-com boom in March 2000. 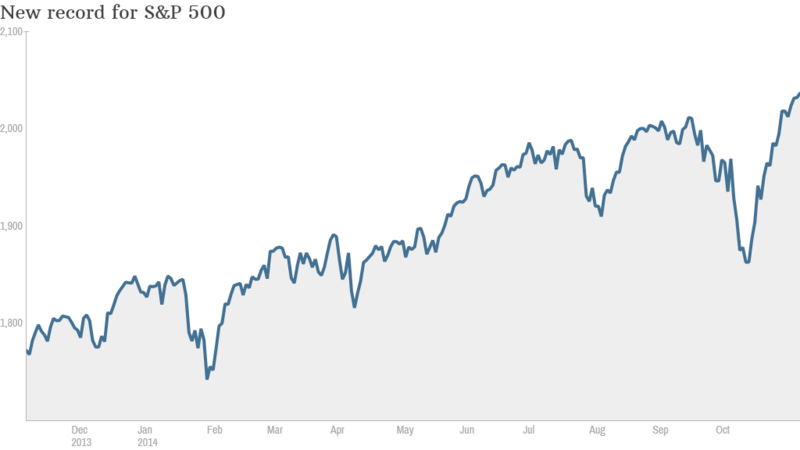 The S&P 500 is now up 10.3% for the year, and the Dow is up 6.3%. Those are very healthy returns, especially given that most investment firms consider an annual 6% to 8% return to be the historic average. It was a steady-as-she-goes kind of day on Wall Street. There wasn't a clear catalyst sending the markets higher, other than oil prices continuing to stay under $80 a barrel and a calm confidence about geopolitics. Transportation stocks had a particularly good day with Alaska Air (ALK), FedEx (FDX), UPS (UPS) and Union Pacific (UNP) hitting all-time highs, likely as a result of low oil prices and indications of solid demand heading into the holiday season. "With the end of the Fed's tapering process and the uncertainty regarding the mid-term elections both in the rear-view mirror, there is little standing in the way of a potentially solid year-end rally," wrote Randy Frederick, Managing Director of Trading and Derivatives at the Schwab Center for Financial Research, in a note. 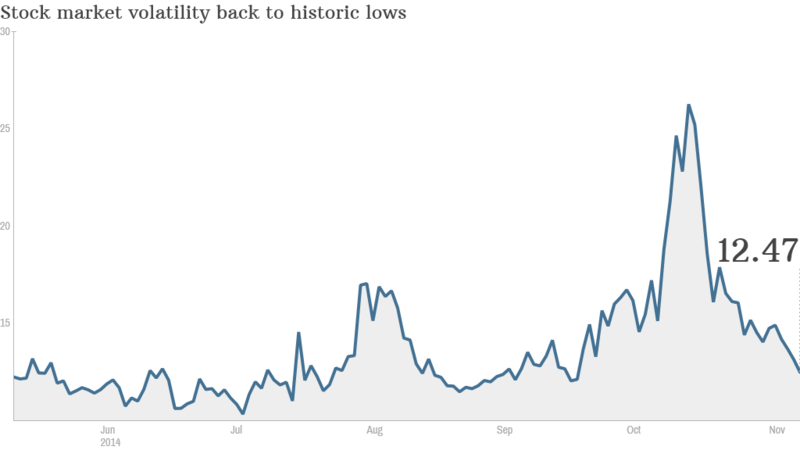 Perhaps even more importantly, volatility in the markets is back to incredible lows. The VIX volatility index, which spiked to touch 30 during the worst of this year's market bobble, is now below 13. Its average since January 1990 is around 20. CNNMoney's Fear & Greed Index is back in "Greed" mode -- an extreme rebound from the "Extreme Fear" it showed a month ago. Today marked the 23rd record close this year for the Dow and the 39th for the S&P 500. Last year the S&P 500 had 45 record setting days. The only woes on Wall Street today were for cable companies. Time Warner Cable (TWC) fell 5% and Comcast (CMCSA) slid 4% after President Obama came out strong saying there should be no Internet "fast lanes" that give priority to some customers over others. It's a hotly debated issue that may make it more difficult for Internet providers. The question for most investors now is whether stocks are getting too expensive. The forward price-to-earnings ratio (P/E) for the S&P 500 is currently 19.1, according to S&P Capital IQ. The historic average is 15, although the average for the past decade is nearly 17.